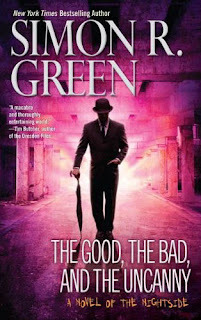 The Good, the Bad, and the Uncanny is the 10th volume in the always strange Nightside series by Simon R. Green. The strangeness is at an all-time high as the Nightside is still reeling from the events of Just Another Judgement Day, which was one of the quickest volumes and more of an interlude than anything else. I read Just Another Judgement Day right before this one, which lays the ground work for the crux of Uncanny. There was something of continuity error in Uncanny that I hope got cleared up before it went to press as I am basing my review off an advance reading copy. Than again this is the Nightside and it is all about screwing with continuity. Basically two characters talk about something as if they hadn't already in the previous volume. If you haven't read the other Nightside books do not skip ahead to this volume as it would ruin everything that happened prior. Green does nothing if not build off everything that is seemingly unimportant from past volumes and he is still not scared of killing off some fairly prominent characters. The Good, the Bad, and the Uncanny shows that Green is still able to push the envelope with John Taylor as he hasn't lost the touch of putting him in situations that seem unwinnable just to somehow sucker punch his way out of. The series formula has not wained on me at all, which is especially telling of such a long running series. Flying carpets, biker neaderthals, twisted religious men, hot pink transportation, and the truth about the running of the Nightside are all covered this time around. To start we get a nice little almost novella of Taylor taking a case to get an Elf to the otherside of the Nightside, which from what I can remember is the first such instance of this race having a role in the Nightside. Green takes it from the angle that Elves and their ilk should never be trusted and rightly so. In typical style Taylor enlists aid for the trek. This time around from the little seen Ms. Fate who is a kind of like an Emma Peel drag queen superheroine. She is much more likable than I was expecting. At first I was missing Deadboy, but Ms. Fate more than holds her own with her dialogue and battle skills. After Taylor clears up that trouble he is accosted by Larry Oblivion to help find his brother Tommy who has been missing since the Lilith War saga. We get Larry's origin story from his point of view, which was nice for a change of pace. A lot of closure happens this time around as things come to a head for many characters including Taylor who gets a 'best of' tour of sorts from Walker in his attempt to have Taylor better understands what it means to be Walker. Fans of the series will not be disappointed as a real showdown with Taylor and Walker finally happens. Through it all you gain a deeper insight into the underpinnings of the Nightside and the growth of John Taylor. The one flaw in the series is the constant repetition of some lines such as "in every way that matters." Yet Green certainly moves the story along at a fox's pace. I give The Good, the Bad, and the Uncanny 7.5 out of 10 Hats. This is setting everything up for the penultimate volume in the series as Green has said he will stop at the twelfth volume. The groundwork has been laid to give the series a strong show stopper. Is 7.5/10 par for the series or better or worse than normal? Yup, 12 books will be the complete series. I'd say 7.5 is par for the series. There are mini arcs though. The 2nd 3 books comprise what is usually referred to as the Lilith War, which is probably the best out of the bunch. Reading the first 3 is must though. But you have to know two things going in. Firstly, these books are done in a pulp Noir style. Green isn't reaching for the literary sky, but to entertain which he usually achieves. Secondly, Green packs his stories to the brim given the tiny page counts. Reading two or 3 Nightside books is about the equivalent to 1 Dresden Files. When you buy a Nightside book you are buying a mini-vacation into that world. Whether that is a good vacation or not will depend on your taste. I caught that repeated conversation and the only explanation I can think of is that Simon isn't paying any attention. Probably bored. He turns in a story outline and some editing company intern fills in the blanks. I am generally a big fan and have read everything he has published but that oversight was a bit startling. The book just seems thrown together without any discernible cohesion. Phrasing repeats and background recaps are a getting a little ridiculous as well. "The series formula has not wained on me at all." Wain is an agricultural wagon.